This article will show you how to use the not-so-well-known updatelock system property to turn Director into your level editor. I'll show the technique using a simple example game, where we'd like to make waypoints for an AI car. Click here to see the demonstration movie. 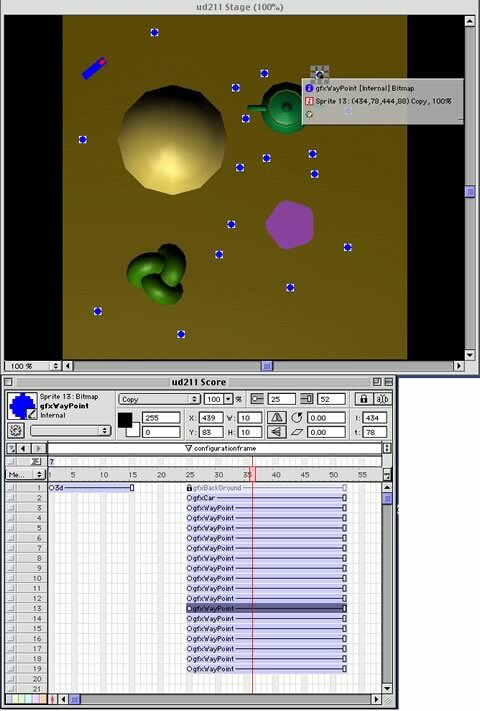 The trick is to use sprites in the score, in a 'configuration' frame. For each waypoint, we'll make a sprite in the score. When authoring, we can drag these sprites on the Stage, to place them exactly how we want them. At runtime, the movie will jump to this frame (without displaying it!) to inspect the properties of these sprites, from which the waypoints will be generated. We'll also have a sprite that specifies the starting point (and rotation) of the car. Now How Do We Code This? but that would show the configuration frame on the stage, which would look real silly. We can add the updatelock = 0, which tells Director not to update the stage when we're going all over the place. Since our game is 3D, we need to have some way of converting this 2D position, into a 3D coordinate. We'll make a scoreToWorld handler, to handle that task. In order to be able to visually place the sprites comfortably, I've placed a top-down screen shot of the scene in the first sprite channel, so you can actually 'see' where the waypoints go. Now you've seen what the idea is, here are a few things to experiment with. Use different configuration frames to configure different levels. This example merely serves as an illustration to the technique. I'm not saying that this is the best technique for this example. In this specific case, (and where you have access to 3D modeling software), it might be better to use the 3D modeler to be your level editor. If you were using Max, for instance, it would make sense to make a 'Dummy' for each waypoint, as these get exported to w3d 'groups', which you can get the position and rotation from. Depending on what your problem is, the technique presented here might, or might not be the best solution for you. Use your common sense. The Director source file can be downloaded in either ZIP or SIT archive format. Lucas Meijer is a freelance Lingo programmer, working and living in Amsterdam. While 3D games are his preference, he works on anything that is a challenge to program. Whenever he is not busy programming, you can probably find him on the fields playing Ultimate Frisbee.